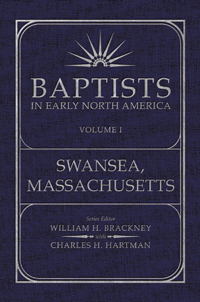 Baptists in Early North America—Swansea, Massachusetts, is the first volume to appear in the BENA Series. Designed as a unique contribution to religious and Baptist scholarship, BENA recovers never-before-published original records and manuscripts for students, scholars, and genealogists. Each volume contains transcribed original seventeenth- and eighteenth-century record and manuscript material, accompanied by a historical introduction, scholarly notation, a comprehensive bibliography, and index. Specialists in each volume have painstakingly prepared the texts and introductory matter. Volume 1 covers the period 1649 to 1844. Known in part as the “Ilston Book,” it is the oldest surviving record of a Baptist congregation in North America and contains equally unique material from the Welsh period of the congregation gathered by John Myles. The record follows the history, theology, and community development of a congregation transplanted from Wales to Plymouth Colony in Massachusetts. The record covers virtually all of the American religious heritage of the era—colonial community development, the Great Awakening, theological diversification, and the Second Great Awakenings. The original one-volume book is one of the treasures in John Hay Library, Brown University.